On Friday, April 27, I woke up planning to take the kids to the park to play. 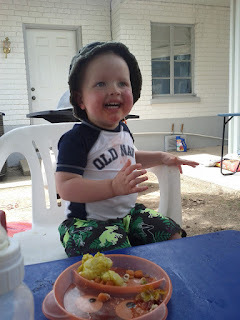 The weather had been fairly good all week, and we hadn't managed to go to the park, so this was the day. 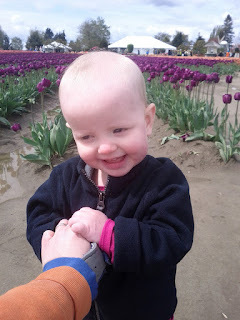 While we were eating breakfast, I checked my email and found an email from a friend asking if anyone wanted to go to the Skagit Valley Tulip Festival with her. We had heard about the tulip festival and wanted to see it for ourselves, so our plans changed. We threw together a picnic, put on our boots, and got in the car. We drove for an hour and a half up the coast to Mt. Vernon, Washington, through town, and out into scenic farmland. When our friends arrived, we went into the farm. 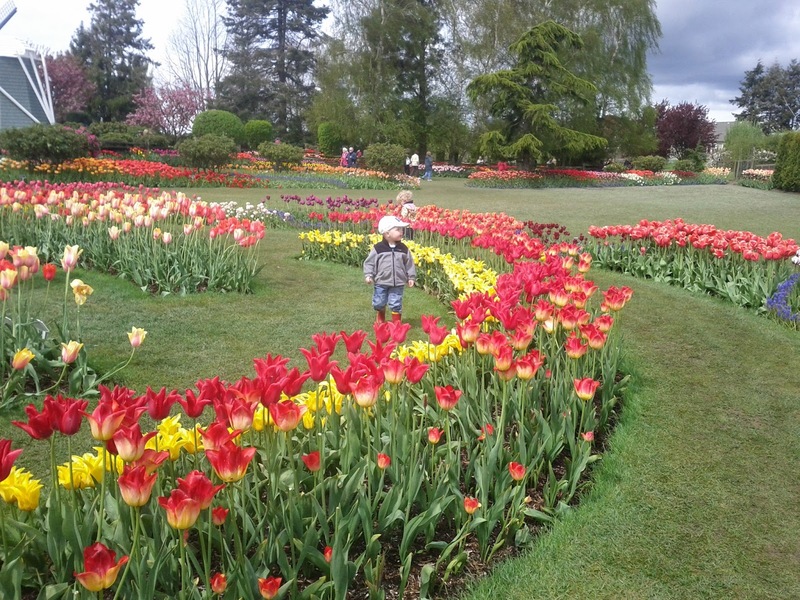 Jared was delighted with this tulip "maze." This isn't a maze for anyone a few inches taller than he is. There were tulips in every color combination you can think of. The gardens were beautiful. 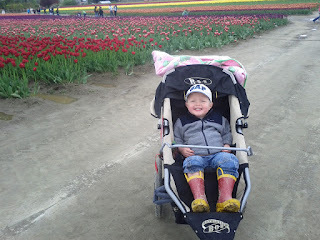 Just beyond the gardens, we found field after field of tulips in bloom. 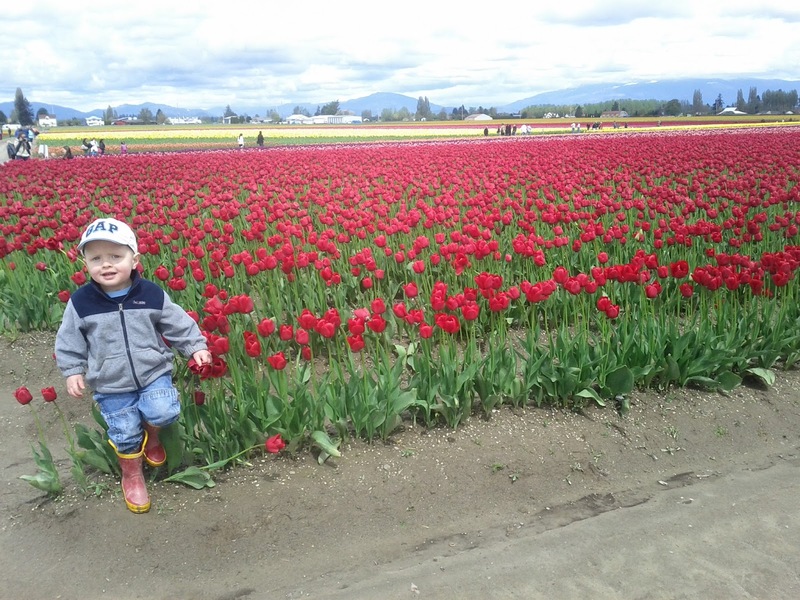 I'm not sure Jared noticed the flowers at all when he discovered the mud. 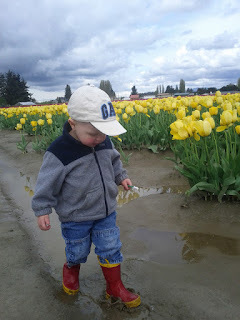 He spent most of our outing wading through puddles with Adalyn and Bailey, the two little girls who came with us. He almost lost his boots a couple of times in deceptively deep and mushy puddles. He was in mud heaven. Eloise spent most of our time at the farm in the baby backpack munching contentedly on cheerios, but she got out for a few minutes. When she was free of the carrier, she immediately tried to escape from me so that she could splash in the nearest giant mud puddle. Our poor little princess couldn't keep her hat on in the breeze. She came away with quite the sunburned little head. 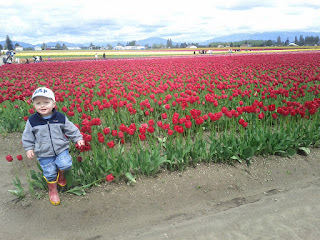 Jared thought that "pose with the flowers" meant "stand on the flowers." Oops. Jared got burned out on mud and tulips before the other mamas were done posing their girls for pictures, so he commandeered the stroller from Adalyn's sister, Baby Maren. Muddy, windblown Adalyn, Bailey, and Jared posed for one final picture before we took off. 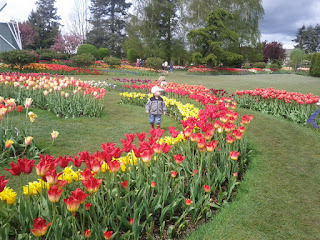 Jared thought this cluster of flowers was also a tulip maze, or else he had just gotten a taste for walking on flowers. Either way, it was time for us to go. We had a quick lunch picnic in the car before heading down the road to the famous Blue Goose Produce stand for the biggest single scoop of ice cream I have ever seen. They make their own waffle cones before your eyes, too. 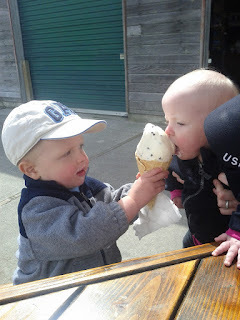 All three of us were full before we finished this one cone. Jared and Eloise both fell asleep as soon as we got back into the car and slept all of the way home. It was a beautiful day for some beautiful country. 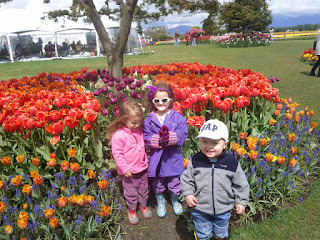 The tulip festival was definitely worth the drive. I am excited now to plant my own tulips in our yard for next spring. Happy beautiful springtime! I have never seen so many things blooming in my life as we have in our gorgeous yard and city. This is the place to experience spring. This mothers' day I get the chance to sing praises to mamas in church. My mom is so cool that I didn't want to limit her praises to the 200 people who will hear me at church, so I'm posting my talk here. Happy mothers' day! Faith is the first principle of the gospel of Jesus Christ. It is a principle of action and of power. We believe in God, the eternal Father, and in his son, Jesus Christ, and in the Holy Ghost. As we learn the gospel and allow that belief in Jesus Christ, and the knowledge of the love and mercy of our Heavenly Father, become the driving force behind all of our actions, we become individuals of faith and integrity. No move can be taken in the gospel without faith. Repentance without faith could not be effective. Charity without faith could not even exist. I don’t think that could be stated more simply or clearly. Professions of faith are just words until our faith governs our actions, leading us to sacrifice and serve selflessly. Mother’s day is a particularly appropriate day to be talking about faith. Women in the church in modern and ancient times, have been noted for their actions of great faith. The Savior honored humble and faithful women throughout his mortal ministry, and, significantly, as his last act upon the cross, as he committed his faithful mother to the care of a beloved disciple, and as his first act after his resurrection, appearing to Mary before any other disciple, even before ascending to his Father. I hope that when I am faced with challenges to my faith, or gospel truths that may seem hard, I have the courage and faith to give such an answer. 20 And they were all young men, and they were exceedingly valiant for courage, and also for strength and activity; but behold, this was not all—they were men who were true at all times in whatsoever thing they were entrusted. Their actions were a beautiful and fitting tribute to the faith of their mothers. They fought valiantly, and through their faith, and, no doubt, the faith and prayers of their humble mothers, all were injured, but none were killed. May each of us treasure this truth: One cannot forget mother and remember God. One cannot remember mother and forget God. Why? Because these two sacred persons, God and mother, partners in creation, in love, in sacrifice, in service, are as one. I hope to do appropriate honor to my mother through my actions. One great example of faithful womanhood and motherhood in modern times is Emma Smith, wife of the prophet Joseph Smith. She experienced hardship and loss beyond anything I can imagine, but she was always willing to give of what little she had, and serve wherever she was able. Because of her faith and service, she was honored in the revelation found in D&C 25, with the title of an “elect lady.” Emma Smith would later serve as the first president of the Relief Society. In Doctrine and Covenants 29:7, the term “elect” is expounded upon. I am certain that many of us have known elect ladies, after the pattern of Emma Smith, and other women in the early days of the church, who hear the voice of the Lord in hardship and loss, and seek opportunities to build and strengthen others, even when their own suffering is great. I am sure that my own mother is one of the elect ladies of the earth today. My mother had a lot of struggles during her teenage and young adult years. She finally married in the temple at the age of 30, but her marriage was fraught with difficulties. After twelve years of marriage, she found herself betrayed by her husband and abandoned with five young children between the ages of four and eleven. 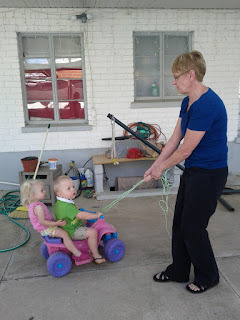 She felt the burden of single parenthood acutely. I know she was often lonely. I learned many great lessons from my mother in the years of poverty and uncertainty that followed. Perhaps the most important lesson was the one she demonstrated over and over- When trials beset us, it is the fool’s way to turn from a loving Heavenly Father. She turned to prayer, fasting, temple attendance, and scripture study constantly. We saw her pay her tithing when she could not pay all of the bills, and we knew that we were blessed because we were never hungry or cold. Our family participated in every ward or stake activity because she wanted us to be surrounded by strong families and righteous influences. When we struggled to define our relationship with our father, knowing the pain that he had caused to our family, she taught us Heavenly Father’s plan for families so that we could love and pray for our dad, but we could know that his choices were wrong. 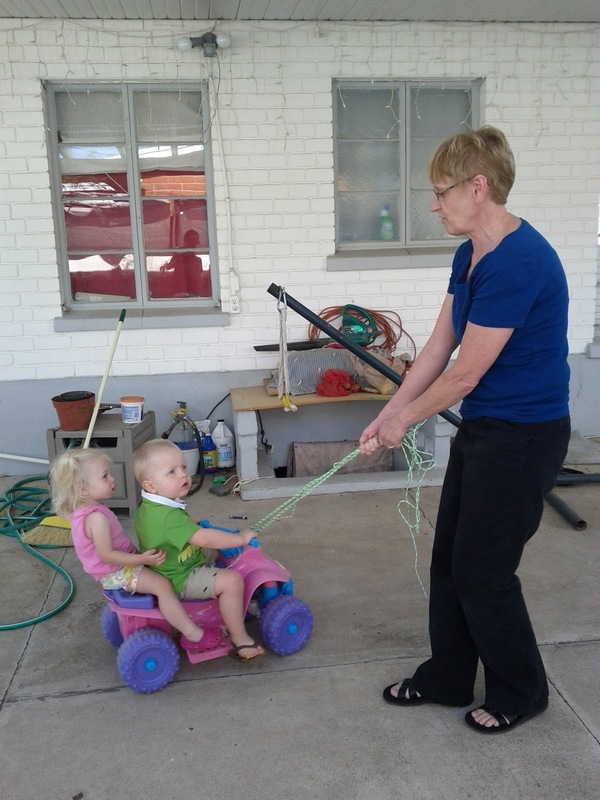 She was constantly alert for an opportunity to serve our neighbors, and she was a faithful visiting teacher. When I talked to my mom a couple of days ago, and told her that I would be talking about her on mothers’ day, she said, “I hope that you will say that I always tried to keep an eternal perspective.” I was glad that she said that because that is one thing that I know she tried very hard to teach me as a self absorbed teenager- that eternal perspective; in other words, putting faith in God behind every choice and action. I hope that I have learned that lesson, and that I can be as steadfast in my faith in Christ as my mother always has been. As a mother myself, even as one of imperfect faith, I have a strong testimony that Heavenly Father hears the prayers of mothers for their children. Childhood is treacherous. Watching my small children fall and get up and fall again, even as they seek for more and more independence makes the constant prayer of my mother heart that my children will be protected from dangers that I can’t foresee or prevent. I have been a mother for less than three years, but I have seen this prayer answered countless times in small and large ways. Once, when going up a flight of wooden steps to our apartment with a newborn Eloise in my arms and a one and a half year old Jared behind me, I reached the top to turn around and see him lose his balance and start falling hard and fast toward the concrete stair at the bottom. There was nothing but gravity between him and unavoidable serious injury. As I watched him, unable to do anything, I saw him stop, suddenly, as if he was caught in a net, only three or four steps lower than he started. 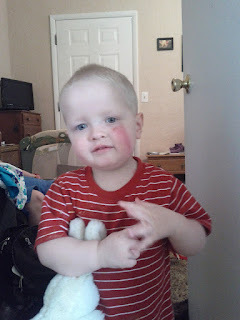 He came out of the experience with nothing more serious than a bruised arm, but I came away with a strengthened testimony that Heavenly Father hears our prayers, particularly the prayers of mothers for their children. Through this experience, and many others, I have gained a greater appreciation for my own mother and for all mothers who do all they can for their children, and rely on their faith that a loving Father in Heaven will make up for their weaknesses and limitations. My own weaknesses and limitations are far greater than my abilities and skills. When it comes to my precious children, I am dependent on that shield of faith as a protection for them and for our family; protection from outside dangers, but also from my own folly. I am thankful for the example of my mother and other men and women who have left us a legacy of steadfast faith and selfless service. As each of us strive to live with greater faith, I would encourage each of you to heed the words of the Savior upon the cross, and “behold thy mother.” Look to the great women of the scriptures and the elect ladies in your own life, and seek to follow their examples of faith, sacrifice, and courage. As we look to these examples, and to our own mothers, and other men and women of faith in our lives, may we find the courage to live with greater faith, that our contributions to our families and to the kingdom of God may be as great as theirs, and that our lives may honor our faithful mothers. Have a Beary Happy Birthday! On April 16, 2012, Eloise turned one year old. We celebrated with family on Sunday, the 15th. First, Eloise opened presents. 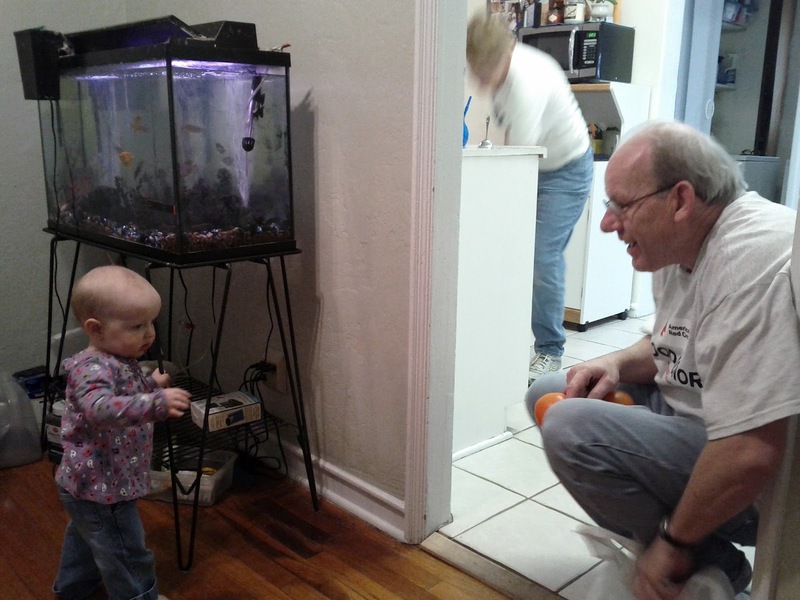 She went crazy for the doll that Grandma and Grandpa gave her. The spinning, light-up thing that Rachel and Annie gave her was also a favorite. 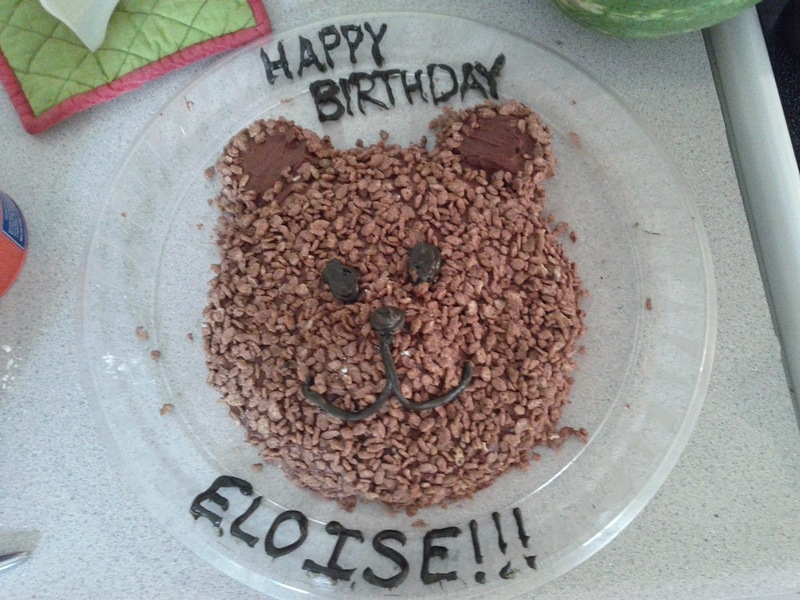 I made this bear cake, inspired by the internet, because the princess loves her bears. 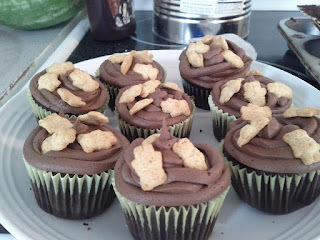 That is a chocolate cake with chocolate frosting, textured with chocolate rice crispies. 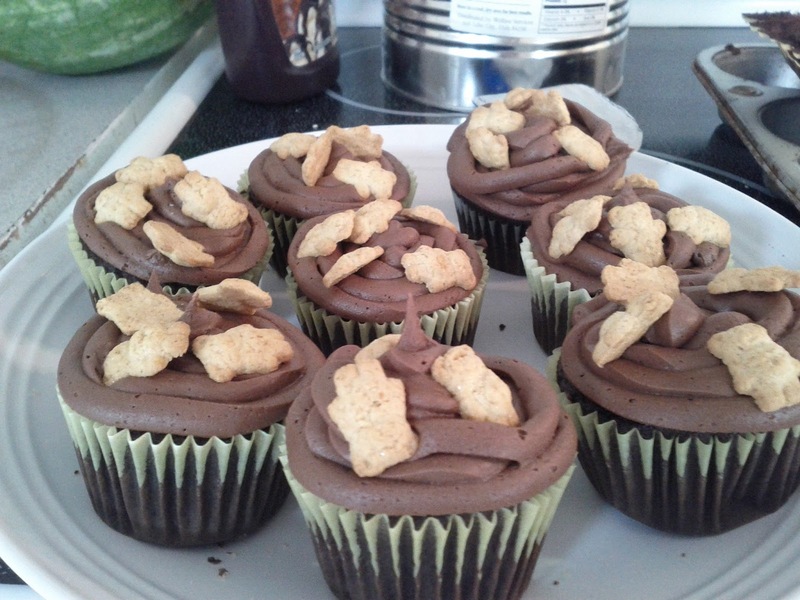 We also had a few bear cupcakes. Eloise was not very interested in the cake. The dent you see here is were I took her hand and pressed it into the cake. She looks like she is eating it here, but I believe what she is really doing is trying to get out a piece that I put in her mouth. Rachel and Jared couldn't wait any longer, so we broke out the cupcakes. Eventually, Jared got frustrated with Eloise's lack of interest in the cake and climbed on the table to show her how cake crashing is done by pulling off one of the bear's ears. By then she was trying to escape. And that is about as crashed as the cake got. All in all, a pretty poor showing for a cake demolition. She was hardly even sticky. 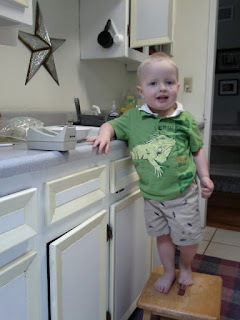 Jared was so dirty after his first birthday cake that we had to clean the tub after his bath. Eloise didn't really even need a bath. I'm glad that Eloise is totally unique. I wouldn't have her any other way. Keep being your independent, energetic little self, beautiful princess. You light up our home. Eloise's twelve month numbers from a week after her birthday: Weight: 21 lbs. 5 oz. (50th percentile), Height: 30 inches (75th percentile). After the 12 month checkup (Eloise got three shots), I took the kids to a nearby pet store to look at bunnies. The shots were forgotten instantly through the healing power of bunnies. Unfortunately, Justin and Marie had to take McKenzie and Peyton home on Tuesday, so we didn't get as much time with them as we would like. There was still lots of quality time with fish, and with Grandpa and Grandma. The cousin party was, as you might imagine, ongoing. Here it literally turned into a dance party for a little while. Jared managed to pull a bike down on himself on Grandma and Grandpa's patio on Tuesday. It looked horrible, but it wasn't anything a popsicle and a couple of days couldn't fix. It's a sad little injury, but I can't help being glad that he saved his accident until after we had had family pictures taken. 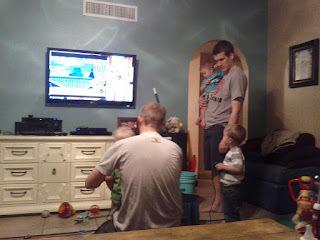 We managed to get in a visit to Dan and Katie and Landon and Cade, before Katie and the boys left on a trip to Utah. We also got to see Lashley and Tania and Sadie and Everett. All of my pictures of the gathering turned out terrible, but here are the boys playing video games, as usual. The weather did get a little cooler later in the week, but it still felt warm to us. 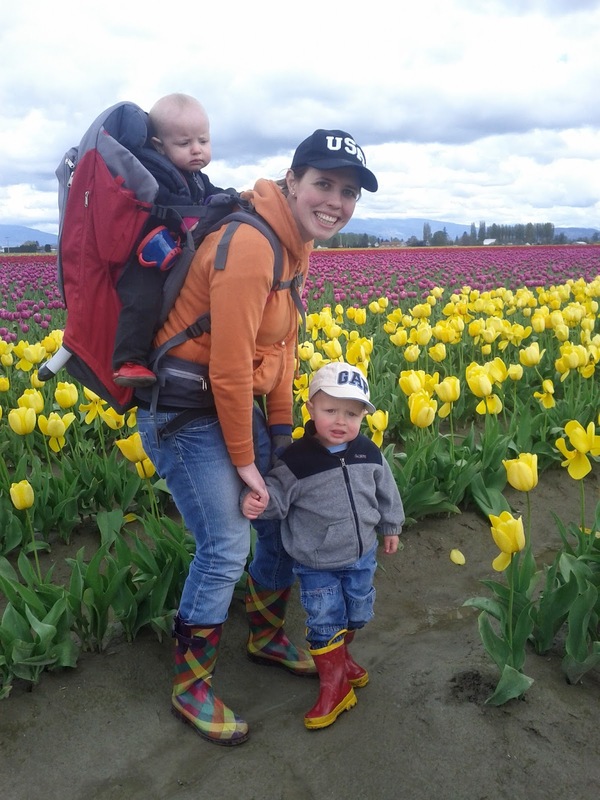 We were relieved to have a chance to thaw out after a long, dark winter in Washington. I'll give you one guess about whether or not this man likes to eat outside. Shooing real and imaginary flies away from his food was his favorite thing ever. "Shoo, shoo, shoo, shoo!" 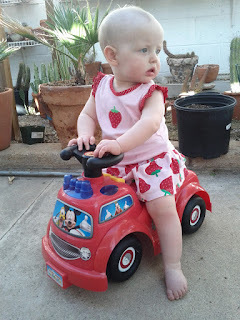 Eloise wasn't too thrilled with the riding toy, but she discovered that it had some buttons that made music, so she hung out for a while. On Thursday we managed to go on a short hike at Sabino Canyon. Jared donned his sunglasses for the occasion. Our stroller did not get a lot of use in Tucson, thanks to a mystery illness laying me out for most of the week. We did break it out for the hike. Since Rachel has preschool on Thursdays, it was just the Knights +Grandma on this hike. At the end of the hike we came to a rare sight in Arizona: water above the ground. You can tell it is early in the year because this wash still has water in it. Jared jumped right in. Eloise was not interested in the water, so we sat it out. She was a trooper on the hike, even though it was breezy, and the princess does not love wind. She waited until we were within a quarter of a mile of the car to have her breakdown. It was a beautiful day. I'm so glad we got out to enjoy the beautiful, scenic desert. 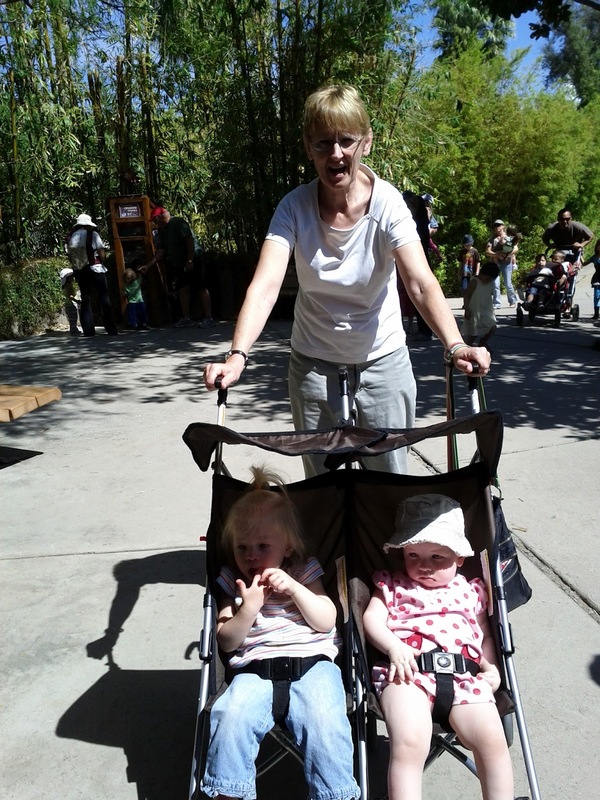 On Friday we went to the zoo with Grandma and the Campbells. 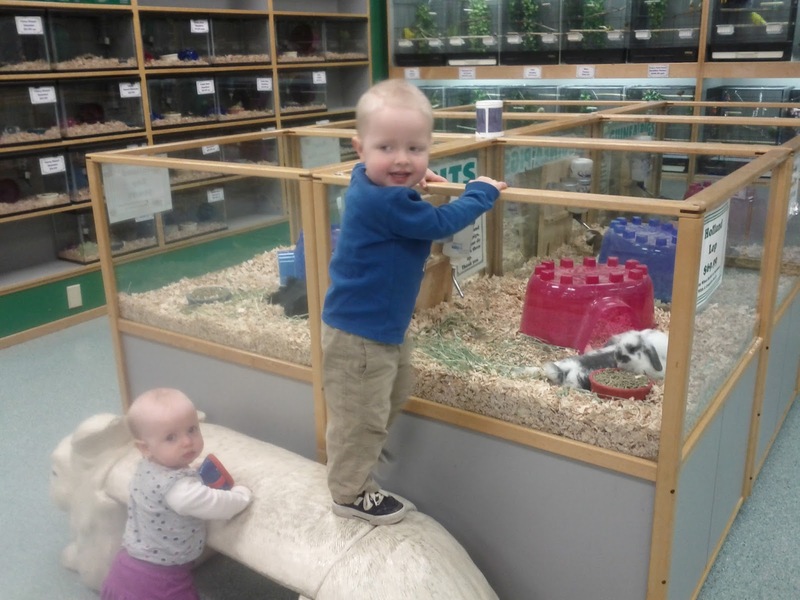 You can read more about our zoo trip on Colette's blog. Rachel fed the giraffes. It's pretty cool to get right up there with the giraffes. The zoo has a new elephant exhibit with baby elephants. 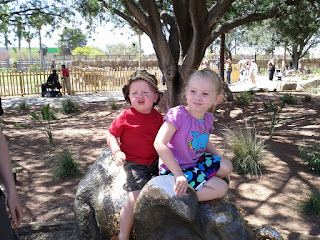 Rachel was a much better sport about posing on the elephant's back than Jared. He was hot. Eloise spent most of the zoo trip lounging in the stroller. She was hot, too. Our bodies seem to have adapted to the northwest already. Here are a few of the zoo's cutest specimens: two little monkeys girls. I'll leave you with this picture of Jared standing in one of his favorite places on earth: between the fish tank and the freezer full of popsicles. The week was coming to a close all too quickly, but we had one more big celebration before we headed home. . .